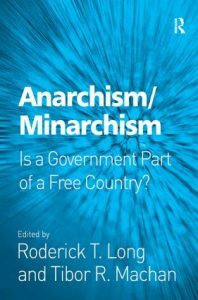 I’m pleased to announce that the 2008 anthology Anarchism/Minarchism: Is a Government Part of a Free Country?, edited by the late Tibor Machan and myself, is about to be released in paperback from Routledge (formerly Ashgate). It’s scheduled for the end of November, but can be pre-ordered now at Amazon (US here, Canada here, UK here). At $55 it’s still a hefty pricetag, but it beats the hardback cost, which varies between $100 and $150. This volume is a much needed revival of a debate critical to Libertarians, but also of significance to political theorists generally. The issue itself goes to the heart of what it means to do political philosophy, and the contributions found here skillfully keep those basic concerns in sight. In addition, I found the writing lucid and fair minded – something often missing in scholarly debate anthologies. I have no doubt that this volume will become a standard reference source for those interested in this particular debate and among the sources one consults when considering the foundations of the state generally. The forceful philosophical and historical challenges to the state presented in this volume should be read not just by libertarians, but by everyone who believes that government is either necessary or legitimate. I’m glad the essays in this volume will now be likely to reach at least a slightly larger audience.